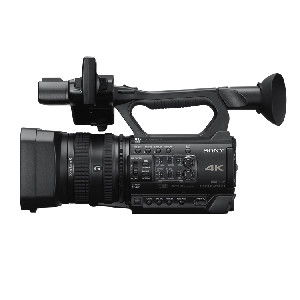 Sony HXR-NX200 is an affordable, compact camcorder with a big 1.0-type sensor and new colour reproduction for superb 4K or Full-HD image quality. It offers all the professional features you need with refined manual controls including three independent manual lens rings, smart fully auto options and more. A large, 20 megapixel* 1.0 type sensor delivers stunning image quality in 4K (3840x2160) or Full-HD at 50Mbps. Its 1.0 sensor is brighter, has higher resolution and offers more bokeh with a shallow depth of field. HXR-NX200 gives you the flexibility to work the way you want to. Natural skin colours and rich mid-range colours deliver vivid, yet true-to-life imagery regardless of exposure setting. 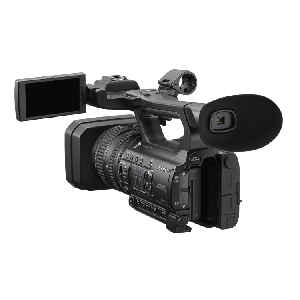 It's perfect for capturing live events such as seminars, weddings and houses of worship. NX200's newly developed gamma curve provides a vibrant look ready to share as soon as you export. There's no need to choose between professional features and superb 4K imaging at an entry level price-point. Advanced manual controls, including three independent manual lens rings, built-in 4-step ND filters and class-leading 4K and Full-HD performance make NX200 a choice you can rely upon for live events, corporate, education and wedding videography. The Sony HXR-NX200 single 20 megapixel* 1.0 type Exmor R CMOS sensor is approximately the same size as a 16mm film frame and seven times larger than three 1/4.7 type sensors combined. The key benefit of this large size is low noise and less blur because more light reaches the sensor, offering clear and steady pictures even in a dark scene with minimum illumination 1.7 lux**. The large sensor size also enables beautiful background defocussing (bokeh) to enable you to focus on what you want to show and defocus the rest of the image. A fixed 29mm wide-angle lens with 12x optical zoom makes it easy to capture even the most expansive landscape scenes while also offering superb clarity and sharpness - maximizing the performance of the NX200's large 1.0 type sensor. The G Lens is Sony's own camera lens family, designed and manufactured to the high standards of optical performance. In addition, your ability to get into close with the most distant scenes is aided by Sony's advanced Clear Image Zoom feature. Once you've zoomed in at maximum 12x optical magnification, By Pixel Super Resolution Technology can enlarge the image by an additional 150% in 4K and 200% in HD while still preserving image quality. In addition, zoom performance can be doubled at any point with a digital extender by up to 24x. The Sony HXR-NX200 is ergonomically designed to provide a lightweight and easy-to-use shooting experience. Three manual, independent lens rings enables smooth, natural adjustment of focussing, zooming and iris control. It can also be used in full-auto mode or completely manual for maximum creative control. Manual dial and buttons on the side of the body allow swift and easy adjustment of IRIS (aperture), GAIN and shutter speed. The white balance is simple to adjust by colour temperature in convenient 100K steps. A built-in Neutral Density (ND) filter wheel includes positions for clear, 1/4 (2 stops), 1/16 (4 stops), and 1/64 (6 stops). This makes it easier to get all the advantages of shallow depth of field even in exterior day shoots, with no need to worry about bringing along and fitting a separate filter. 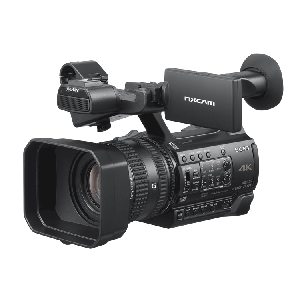 To extend recording time and workflow flexibility, the HXR-NX200 is equipped with two memory card slots and is compatible with SDXC and SDHC cards. RELAY mode automatically switches recording from the first to the second memory card when the first is full, while SIMUL mode permits simultaneous recording to two memory cards (for example to create an immediate back-up version). The NX200's two Start/Stop buttons on the handle grip, and camcorder body, can independently start and stop recording on different memory cards while recording in SIMUL mode. The Sony HXR-NX200 has a 0.24-type Electronic Viewfinder (EVF) and an easily adjustable, flip out 3.5-type LCD. Both offer 1550K dots high resolution for precise monitoring and low latency however you choose to shoot. 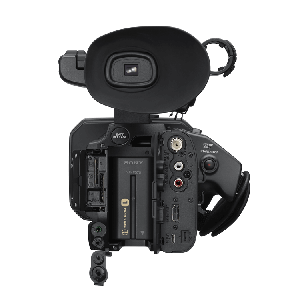 The Sony HXR-NX200 takes advantage of Sony's flexible Multi-Interface (MI) Shoe, which provides power, signal connections and coordinated on/off switching to compatible Sony accessories. For example, you can connect and control Sony wireless microphone systems such as the UWP-D11 or UWP-D12 with SMAD-P3/P3D adapters or attach the HVL-LBPC light*. *All sold separately. HVL-LBPC is controlled but not powered by HXR-NX200. There's no need to worry about adapters as the NX200 provides a wide variety of built-in connectivity options including HDMI, Multi/Micro USB, professional audio XLR terminals, REMOTE and Composite (BNC).